Pakoda; A perfect snack to have Garma Garam with a hot cup of Adrak Chai! Monsoon has its pros and cons. The muck and getting drenched in the rain is not the best feeling, isn’t it? But what we really love about monsoon is enjoying crispy and crunchy Pakoda with a hot cup of chai. During monsoon, our hearts start yearning for something spicy and crunchy to munch on. 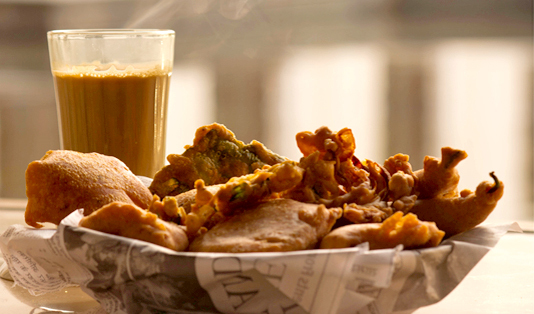 Even those who are very health-conscious cannot resist munching on just a pakoda or two with their evening chaai! Indeed, savoury snacks like pakore are as much a part of our lifestyle as mithai is part of our culture. We have been brought up on tasty snacks like these, which accompany friendly banter, lively chats, and in general offer the perfect environment to bond with friends and family! Pakode are favourite of every household as they are easy to cook. 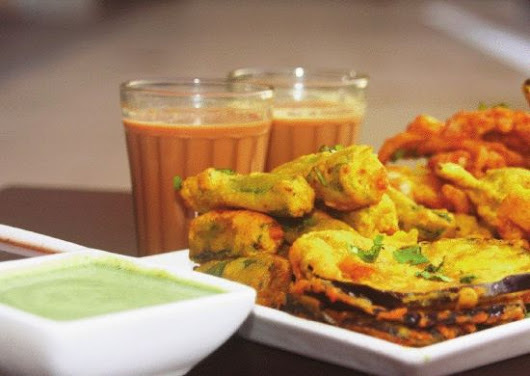 Although there are a lot of shops to visit where you will get the best tastes in Jaipur and that too in numerous varities like Pyaz Pakoda, Bread Pakoda, Mirchi Badha, Paneer Pakoda. Its pouring in Jaipur and my cravings for garma- garam bhajiya with adrak wali chai was already on its peak when I decided to keep aside my healthy eating idea and decided to stuff myself with some crispy and piping hot pakoras. I love all the varieties of pakoras be it moong dal, channa dal, potato or onion made by mom and how much I enjoyed it with the green, tamarind and tomato sauce too. Onion & Dal pakora being one of my favorite is also very popular in Jaipur and is easily available with any street-food vendor. I love the texture of Onion & Dal Pakoda, this deep fried bhajiya is crispy from outside, soft and porous from inside.